Technology has gone far beyond human conception in the modern era of the machine age. Artificial Intelligence is what that rules almost all spheres of human existence, thanks to the ease at which it blends with our ecosystem. Digital Marketing is no exception that could escape the visual field of Artificial Intelligence and has begun to go hand in hand with each other. The way in which AI is defining digital strategy is its ability to perform all aspect of content automation starting from data collection to data curation and distribution. Modern businesses see the intrusion of AI into digital marketing as a welcoming strategy as they are able to gain their customer insights instantly and accurately. What is the relationship between AI and Digital Marketing? There is tremendous scope for digital marketing when mediated through artificial intelligence. Artificial intelligence enables better user experiences for end consumers, predicts the flow of business analytics better and renders targeted marketing scopes that are capable of bringing in a high return on investment for businesses. Though the system was not approved by marketers initially, a number of businesses are not beginning to gain confidence in this system in recent days. Artificial intelligence made its presence in the online industry through processes like machine learning, big data, Internet of Things etc., and has all the scope to make remarkable changes in the online industry in the near future. People tend to follow a website if they feel comfortable using it. The website has to be designed in such a way that its visitors are able to use it freely. With the help of AI in digital marketing, it will be pretty easy to predict the behavior of the buyer, their buying potential, what pages they search and on which pages they spend the maximum time etc. AI is also able to manage chat boxes to ease customer service issues and also handles all the queries intelligently and at a fast pace. AI in digital marketing improves recognition of a business, its excellent features roll out shopping cart payments faster, it is able to solve all security concerns pertaining to online transactions. It collects data from user behavior and helps in improving inventory for e-commerce portals. Its algorithm in decision making which is based on the interests of the prospects helps businesses in improving their return on investment. Artificial intelligence is not just capable of tuning business requirement based on past experience of customers, but also predicts the behavior of new and existing users. It makes use of data management platforms and collects data on the entire online behavior of the consumer and not just about a particular session. This helps businesses in personalizing their offers for their targets and converting them into potential leads. It’s all new algorithms and accuracy in predicting customer journeys at the right time frame makes it a more efficient system to determine sales forecast and returns for the business. In short, the success of a business lies in its indulgence in artificial intelligence. One of the biggest drawbacks of many businesses that fail is their inability to meet their customers’ needs within a stipulated time frame. With the help of chatbots managed by AI tools, it is possible to resolve customer queries fast and it also builds their trust as these chatbots give the image of speaking to a real customer service executive in real time. These chatbots are capable of answering simple questions and uses phrases that sound more like a human. They are available round the clock and all days of the year, thus reducing wait time for consumers. This AI tool helps improve the satisfaction of customers and they are able to rely on a company better to try its products and services. With the help of AI infused into digital marketing, search engines are able to perform better, have become smarter and easier to search without getting clumsy. As AI tracks the web behavior and future decisions of the consumers, it helps them with targeted search results, making the overall searching process hassle-free. Digital marketing has made it easy for businesses to find the right audience from different geographic locations irrespective of the niche they fall. AI in digital marketing helps in taking a brand right at the doorsteps of its clients based on their interests, brand focus and buying behavior. It also helps with advertising consciously by using posters and other sales material in accordance with customer preferences. 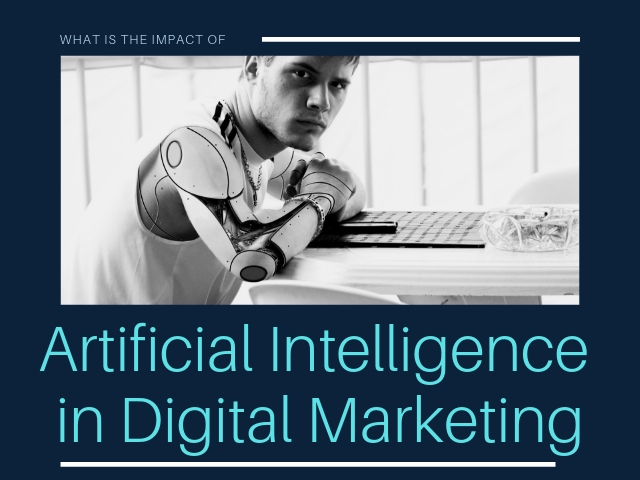 When the term artificial intelligence was first spoken in concurrence with digital marketing, people first thought of it as a Rank Brain algorithm. The theory of this algorithm was first proposed by Google as a machine learning system that was capable of giving prompt answers to the questions asked by users. Rank Brain was programmed to respond to consumer queries the same way as humans would. AI uses actual statistics models that are intended to identify all the consumer prospects who would respond to an offer positively. It connects consumer behavior with anticipated results. For Google AdWords professionals, this tool is specifically beneficial, as when they define the objectives of the sales campaign and their target audience, the AI tool recommends them all the strategies to achieve their objectives. AI analytics helps marketers to extract all relevant information from data and predicts users buying behavior patterns and purchase trends. Accelerated mobile pages or the AMP are the lighter versions of the traditional web pages that aim to improve the mobile web drastically. It also helps in decreasing the load time of search pages and thereby enhances user experience. Having an AMP page for business gives it all the credits of ranking on the top three search results of search engines. The website speed is also enhanced along with mobile optimization along with the change of getting placed at priority page ranks. Chat Bots that are powered by AI always treats the consumer with utmost politeness. It treats angry consumers patiently and is able to handle a number of customer requests and queries simultaneously, decreasing wait time. Apart from resolving people’s queries, it also creates a personalized advertisement for users so as to help them boost their sales. They could track purchase patterns offering a chance for business to modify their sales strategy accordingly. With the help of AI, it is possible to target ads based on the interests of the audience. The power of machine learning is that it understands the purchase intent of users. It is able to analyze millions and billions of search queries across trillions of websites and figures out those people who are close to buying a product and would surface Ads on their screen that would be relevant for their purchase. Some of the language generations AI tools allow the user to turn data into the text of any size, format, and language. The tool is able to create billions of articles that sound more like a human on almost all topics. It is indeed an expert in creating data focused content such as market data, earnings reports, essays about sports matches etc. Another AI tool, Acrolinx is able to chunk out content with high precision and scalability with the help of its natural language processing system in multiple languages. After creating credible content, the tool also helps in taking the content to its target audience. It creates content that is a combination of images and texts and ensures the best reader engagement. Though AI cannot replace authentic content writers and experts, it could boost the production of basic contents. Everybody likes personalized services as it gives the impression that a company is truly interested in the needs of his consumers. AI is very much beneficial in rendering personalized services to every user. It analyzes data points and displays personalized content to individual prospects after analyzing their device, past interaction, demographics and location. AI reads the micro-moments of customer interaction with the business and sends them regular push notification and automated emails in an effort to transform prospects into leads. Answering queries of customers in their known language in a natural voice query helps businesses gain their attention and loyalty. Google has disclosed that more than 75% of its voice queries raised in Google Assistant services has been asked in a natural speaking tone and are not disclosed as keywords as typed in Google Search. Though Artificial intelligence has tremendous scope in digital marketing, it has its own limitations as well. Marketers have to depend on individual solutions to perform independent marketing tasks. A range of different tools has to be used simultaneously so as to run an effective AI-powered marketing strategy, which is a time consuming and expensive entity. Most of the AI-powered algorithms are capable of running on their own, but someone needs to supervise them and start their ignition. Technology has to still go on a long way to create an AI tool that mimics a human perfectly. The system is not capable of thinking on its own and is only programmed to do so. It is not capable of performing split judgments as that of a human. The system is not capable of showing any empathy or compassion to the customers or their families and would still be sending promotional offers when the consumer is fighting a tragic event in his personal life. Its lack of emotions could sometimes prove fatal to a company’s reputation. The cost and maintenance of the AI system are heavy. It does incur purchase, maintenance, and repair cost. The software would also require upgrades frequently so as to adapt to the changing business environment. The Cost of using AI tools should be calculated based on the ROI of the business. The system does not feel or think and lacks creativity as that of humans. Though it could assist in creating content that is full of pictures, charts, and other imagery, they could not compete with something that has been created by a real human. Artificial intelligence is capable of saving businesses and e-commerce marketers their money and time. For example, Chat Bots does the job of the sales agent and renders immediate insight for marketers on their sales trends and on their high performing sales strategy or advertisements. Machine learning does not come as a threat to existing jobs and is only meant to get the tasks easier than before. Bots take the responsibility of handling recurring tasks and deep tasks that require human intervention which would still be a human responsibility. In Short, AI helps to gather all the data that is been spread across a number of applications in one place so as to help business owners gain accurate insights on which direction to lead their business strategy.